At Invision, we are always looking for ways to improve eyecare for our patients. This is why we are happy to invest in new technology that allows us to give patients the very best care possible. How it’s impacted eye exams. The Optos imaging technology has made it much easier for us to detect problems in the eye, so we are able to diagnose and treat conditions earlier. This leads to better outcomes for our patients. For so many conditions, early detection is key! 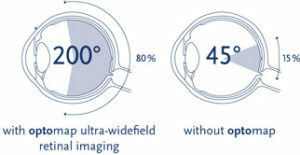 The way we view the retina, which is located at the back of the eye, has completely changed since using Optos technology. We are now able to see a 200-degree view of the retina. This is a huge improvement considering we were only able to see a 45-degree view without Optos imaging. Now that we have a better view, we are able to easily see parts of the retina that are difficult to image with other cameras. Because we are able to see much more area inside the eye, we are able to conduct a more thorough eye exam. Another major benefit is from the patient education perspective. These images also make it easier for patients to visualize and understand what’s going on inside their eyes. Dr. Jon Gudeman said “It is definitely a ‘wow’ experience for them to actually see what the inside of their eye looks like.” Some patients have even asked if they can take their image home with them and frame it! This new technology allows us to care for our patients like never before! It allows us to see subtle breaks and tears in the retina that we wouldn’t have been able to see in the past. “This gives us the ability to track small problems over time and intervene before they become vision threatening,” Dr. Scott Mann explained. Early diagnosis of an ocular condition could potentially save a patient’s eyesight. Dr. Ami Nadolsky found peripheral hemorrhages (leaky blood vessels in the back of the eye) while using Optos technology. Discoveries like this often inform the patient of systemic conditions – such as diabetes or high blood pressure. What do our patients think about this new technology? Our patients love the new technology. Patients have told us that this test is quick, easy, and most importantly, comfortable! An eye exam using Optos imaging can be done without dilation, so patients do not need to worry about their vision being compromised. Take a look at the image below so you can see how truly amazing this technology is. We encourage you to make an appointment with us and experience this amazing technology for yourself! 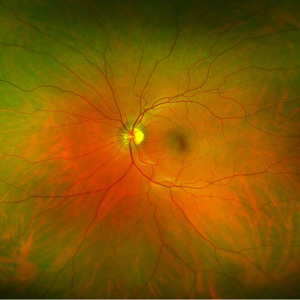 Optos image of the retina, located in the back of the eye.